SPT Energy Group is a specialist monitoring and inspection company for the petroleum, petrochemical and pipeline sector for the offshore industry. With its subsidiary STARR Networks, the firm supplies its services to both offshore and subsea applications. By finding practical solutions, the firm aims to identify issues that may otherwise go unobserved, as well as potential problems and their possible side-effects before they take place. SPT uses experienced industry consultants, who provide a focused and comprehensive service throughout the construction process while submitting complete reports on a daily basis. All consultants are certified in specific disciplines and strategically located globally, allowing the company to recruit local personnel. This lowers the travel related expenses. STARR Networks’ end measurement system (EMS) uses solid technology and equipment to electronically capture ID and wall thickness measurements from pipe ends, before being used to determine wall thickness and/or ovality anomalies. The EMS is a unique and cost-effective method of collecting, storing and reporting dimensional information of pipe ends. The company combines the experience of qualified personnel to collect the data and the latest technology to record, store and manage the data. Aside from being accurate and reliable, the EMS is the most flexible and mobile method of collecting pipe end dimensional data. STARR Networks’ riser array system automatically establishes optimal pipe fit up by using the data gathered by the EMS and performing a complex algorithm that plots an optimal riser weld map based on a minimum ‘high-low’ fit-up. The system is extremely flexible and is able to accommodate additional criteria that may have an effect on pipeline design, such as long-seam alignment and additional measurement points. The program is able to sort pipe into fit-up ‘groupings’ based on predefined ID and wall thickness tolerances. 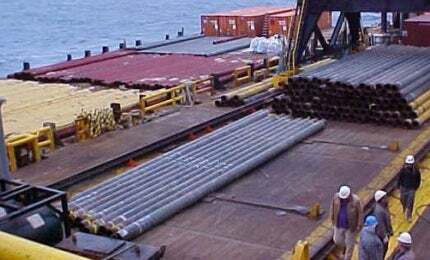 STARR has successfully measured, arrayed and has more completed and producing steel catenary riser (SCR) strings in the Gulf of Mexico in-service than any other method of measuring in the industry to-date. The STARR Trak asset management system (AMS) ensures that the client’s most valuable assets, including pipes, assemblies and equipment, are monitored throughout the project lifecycle. This service starts at the mill and continue through final installation and beyond into project storage and/or inventory. The STARR system uses state-of-the-art tracking methods, ranging from a simple barcode to the latest GPS and RFID systems, and is customized to meet the needs of the client. The AMS also collects mill test reports (MTRs), quality assurance / control reports and photos, allowing project managers to be fully informed with project status updates. It was designed to reduce human error, thereby minimizing the potential for transfer and data entry errors. The system features customized solutions for project-specific goals and cost-effective project inventory management. It provides online access to asset location information and project data and assists in the prevention of misplaced or stolen project inventory.